Michael Haneke’s The White Ribbon had to fight it out with quite a few heavyweights this year at Cannes for the Golden Palm including Ang Lee, Pedro Almodovar, Jim Jarmusch, Jane Campion, Lars von Trier and Quentin Tarantino. It has also been selected, but not without some controversy, as Germany’s official entry for the Oscars. All I can say is that Austria must be happy. Since the end of the Second World War, fascism has been studied and dissected on film many times over with varying degrees of success. With a veteran such as Haneke at the helm, writing an original script for the movie, I did expect more than what The White Ribbon presents here. Some reviewers have pointed out that being familiar to Haneke’s body of work will help one appreciate this film more. I had only seen his The Piano Teacher (2001) before this one and felt that The White Ribbon does not really succeed because Haneke undoes everything that he did right in the former film. Even his subtle, cerebral and gently commenting mise en scène is not able to heal the film from the blows dealt to it by its script. Sure, it is an ambitious film that many directors would not have been able to pull off, but it falls way too short of standard for a director who has established himself as one of the most important directors working. 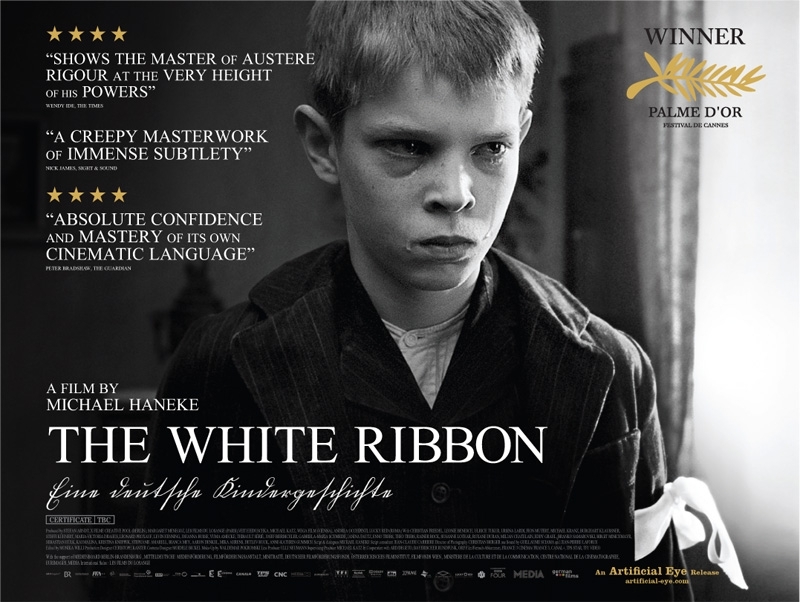 The White Ribbon brings to us a chain of mysterious and violent events that occur in a village in Germany prior to the First World War as narrated by a teacher (Christian Friedel) who worked in that village during that period. We are presented with a host of characters from various walks of life – the Baron (Ulrich Tukur) and his wife (Ursina Lardi) who provide employment to majority of the village, the Fender family of peasants who have just lost the lady of the house in an accident at the Baron’s workplace, the village doctor (Rainer Bock), who has recently had an accident riding a horse, and his mistress and the midwife of the village (Maria-Victoria Dragus), the village priest (Burghart Klaußner) and his family and the narrators own love interest – the new nanny at the Baron’s – the seventeen year old Eva (Leonie Benesch). We are made privy to the happenings of each household and the dirty underbelly hiding behind the flawless exterior of the quiet and secluded village. Mishaps pile up one after the other, progressively violent, and suspicion soars in the village as the culprit is nowhere to be found. All these characters and events are held together on a single clothesline that consists of the children of the village. They are the witnesses and victims of the events that unfold. They are also the documents that would define the course of history – of the village, of the country and of the world – that is to come. Primarily, Haneke’s film proposes political, social, religious and sexual repressions exhibited on a young generation by its predecessors as the roots of fascism and places this argument in the context of pre-war Germany. Although these forms of repressions have been studied individually and in considerable detail in many other films of the past, The White Ribbon attempts to integrate all these influences into a monolithic attitude that defines the course of a society. As observed by many reviewers, The White Ribbon bears remarkable resemblance to Clouzot’s wartime classic The Raven (1943), which scathingly exposes the changes in mentality of a collective during uncertain times and the hypocrisy and hate that such a political climate brings to surface, in its study of a group as a whole wherein disparaging threads eventually converge to draw out a single, coherent portrait of the group at a particular time. The class system is tangible, with the aristocracy, intelligentsia, the middle class and the peasantry being represented with clear demarcation. The Baron and his wife – the upper class – have only their personal relationship and their property to worry about. The bourgeoisie is content in sticking to a set of middle-brow principles (there is way too much formality going on in the film) and maintaining status quo. The peasants can only worry about everyday survival. The apolitical intelligentsia – typified by the doctor and the teacher – is busy with its own romantic encounters and perversions. Cinematographed by Christian Berger, this isolation of the clerisy is summed up in two stunning shots in the film – one during the dance at the village fest (reminiscent of Ophüls’ magical Madame De… (1953)) and one on a horse carriage (reminiscent of Werckmeister Harmonies (2000), one of the best explorations of fascism on film) – in which the teacher and his love interest Eva are alienated from the village events. And whenever a member of any class tries to digress from these functions, they are berated and made to return to their position by either the class divide or the generation divide. The White Ribbon presents us a seemingly pacific society which thrives on domestic bureaucracy for survival and maintains hierarchies to perpetuate that status. Haneke presents these power games not as a ping-pong rally, as we have seen in so many films, but as a chain of dominoes. In his world, there is no such thing as retaliation. Everybody has to conform to and perform specific roles in society – willingly or otherwise. The elder Fender has to play the role of a helpless farmer whereas his son, the radial, has to play the part of an obedient child irrespective of him being an adult. There is an obligation placed on everyone in the hierarchy by ones above them to conform to certain rules and to get punished upon transgressing those boundaries. The priest ties a white ribbon – another stereotype which symbolizes innocence (as defined by Protestant morals) – on his adolescent son’s arm to remind him of his duty to ward off worldly temptations and lays down an unwarranted responsibility upon him to play the role of a moral Christian. This seems to be the plight of every child and young adult in the village who can’t seem to counter their “masters” and are forced to channelize their reactionary violence through other means. Like Estike (Erica Bók) in Satan’s Tango (1994) and Isabel (Isabel Telleria) in The Spirit of the Beehive (1973), both of whose forced passivity and oppression translates into graphic violence on powerless creatures (I can imagine a restless Chris Marker tossing around in his seat), these children, too, exercise their power on those lower down the hierarchy (The White Ribbon could also be titled “The slap fest” for domestic violence in the film is commonplace). Moreover, this kind of contrived passivity that we observe within the village is reflected in the larger picture of Germany. The White Ribbon is set in a time just before the assassination of Archduke Ferdinand that triggered the Great War. History stands witness to the fact that Germany also went through such cycles of passivity followed by misguided violence like the children in the movie (the film is subtitled “A German Children’s Story”). If Germany’s army was curtailed after the first war and Alsace and Lorraine confiscated, it would give birth to a patriotic movement that would go on to mutate into a fascist force. If the second war resulted in a greater chastisement and imposition of eternal guilt on its citizens by the western world, it would explode into a misdirected “terrorist” movement – the RAF (“…punishing the children for the sins of their parents to the third and fourth generations” reads a note dropped at the scene of one of the crimes). Although Haneke shoots in black and white and has the narrator recite the story in the past tense, his film resonates in the contemporary world too. At one point in the film, the priest tells the doctor’s son, who asks his permission to shelter an injured bird, that the bird in his room is used to captivity while the one in the kid’s hand is used to freedom. The upper class in The White Ribbon flourishes by keeping the rest of the village engaged in the economic clockwork that it has setup and by ensuring that any subversion will only result in despair and struggle for livelihood for the insurgents. The elder Fender, although aware that the Baron is responsible for his wife’s death, cannot do anything about it for any action on his part will put the future of his kids in question. This situation isn’t much unlike those in today’s capitalistic societies which have a strong religious backbone. Evidently, the film’s scope is large. Haneke attempts to study and integrate the very many factors responsible for the rise of fascist movements by actually having many threads in the narrative to illustrate each of these factors. And this seems to be one of the biggest drawbacks of the film. Haneke has way too many characters to have depth in each of them. What begins as an incisive study of a few characters goes on to become a document of the society at large, in which individual characters are sacrificed to drive forth Haneke’s idea. His work here turns out to be a film that is built on a set of judgments made by the writer-director rather than a keen exploration of issues. Compare it to the film that it pipped at Cannes this year for the Golden Palm – Jacques Audiard’s A Prophet (2009). Audiard’s film, which I think is one of the few brilliant films of the year, is sufficiently ambiguous and presents us with sketches from the protagonist’s life. Audiard does not give us an “idea” or a “message”. He lets us form any possible meaning out of the film’s observations. Haneke, on the other hand, sacrifices truth for meaning. He cuts from one vignette to another in a deterministic fashion to serve a set of preconceived ideas. His hop-step-and-jump approach works wonders in the initial part of the movie, when we find ourselves struggling to sort out an overarching theme, but it goes on to over-determine the central idea of the film, just falling short of being didactic. Eric Hynes’ review sums up with ease my complaints about the movie. It is true that the film, to a good extent, explores fascism as a phenomenon of the masses rather than that of a single evil soul, but Haneke dwells a bit too much on kindred events to remove any scope for thematic enrichment. I do not intend to say that Haneke bites off much more than he can chew, but just that the way he goes about chewing seems inefficient. It seems to me that the film would have been better off had Haneke pruned down many of its narrative elements in order to provide depth instead of attempting to crystallize a meaning. By pruning down, I do not mean simplification of its themes or trivializing of the issues at hand, but that the number of characters could have been held at a bare minimum. One fatal blow for The White Ribbon is that, although there is a narrator who provides the basic “facts” about the film before Haneke illustrates the in-between events visually, the film lacks a constant perspective using which all the disparaging ideas could be integrated. It is true that Haneke denies emotional identification in the movie, but the problem is that he does not even provide a reference against which the audience can interpret the events. Haneke’s script, in essence, is a consolidation of the themes Bertolucci explored in detail in individual films. The White Ribbon shares with The Conformist (1970) the idea that sexual repression and social conformism may be the prime instigators of fascist drive. More importantly, the depiction of fascism as being perpetuated by religion and its minion unit – the family – is also that of the masterful The Last Tango in Paris (1972). And the master-slave relationship between the Baron and the Fenders is but a miniature version of 1900 (1976) – an ambitious film that strays off and moves into self-parody. In all the above cases, Bertolucci provides us with a constant perspective, even if he has multiple protagonists, so that we are able to clearly assimilate and make judgment. On the other hand, The White Ribbon lacks a single coherent perspective (or has only one perspective – Haneke’s) and individual scenes, although possessing enough ambiguity of their own to be called virtuoso, exist only to conform to Haneke’s meaning and judgment. Because of this over-emphasis on the central theme, The White Ribbon eats up many of the other possibilities which the first half of the film puts forth. Even at the end of the film, we do not know who commits these atrocities. It could well be some of the repressed members of one of the social classes and there are enough evidences to actually find a one-to-one matching. Haneke does not implicate them and finishes the movie with an open ending (“open” as far as the genre is concerned). Sure, it makes it clear that it is the whole society that is to blame. But Haneke’s writing prefers to lean towards and to underscore endlessly the idea of a repressed childhood and forced conformism to such an extent that it almost obscures the other dimensions of the movie. The film begins with the narrator confessing that many of the elements in the story he is gong to narrate are hearsay, preparing us for the narrative ambiguity in the film, but the film promptly repudiates that statement and removes any thematic ambiguity the first half may have offered. Scenes like the violent outbreak of one of the village boys on the Baron’s son and the priest’s daughter ripping apart her father’s pet bird are inserted into the narrative in a contrived and unsubtle fashion to be regarded as worthy. So are the scenes of the parents’ behaviour towards their children that end up seeming only like filler materials which aid to fatten a shallow analysis based on a single new idea. But even with a wafer-thin idea on text, the director has enough freedom to explore it cinematically. Bertolucci did it in The Conformist with its dynamic mise en scène, which took over the job of providing meaning and emphasizing the central idea, however simplistic it was on paper, unlike Haneke who relies here on his script to do that. That does not mean that Haneke’s film is technically unsound. Right from the first shot, where a peaceful horse ride in a serene countryside is suddenly interrupted by a jolting moment, Haneke announces the soberness of his gaze. He keeps alienating us from the movie with his choice of B&W, the detached distance of the largely stationery camera, the painting-like stasis of the images and his restrictive framing (his indebtedness to Bertolt Brecht is discussed in detail here). Sure, he does very effectively disengage us from the narrative to make us reflect on the events rather than identify emotionally, but he also goes to the extent of denying omnipresence to the narrator for this purpose. And that hurts the film.